If you've dropped into La Sirène's brewery in recent times, you'll be aware the team there is amassing quite the collection of barrels. If you haven't but you're a fan of the brewery, you'll be aware they've been emptying and releasing a fair few of them too. Now, with Good Beer Week and GABS rolling around for another year, they've unleashed two more. 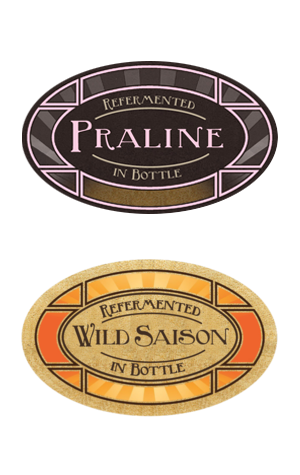 They're barrel aged versions of two of the brewery's best-loved beers, one of which is the Wild Saison that was La Sirène's second release, back when the use of Brettanomyces was rarer than hen's teeth in these parts. This version spent 15 months in French oak and, having tried it side to side with a more recent "straight" Wild Saison, has changed rather a lot. Whereas the Brett in the straight beer lends a drying intensity to the beer, here it appears in a more fruity, berry like manner. There's still that rich maltiness there too and the dense, stewed fruit character that seems to be a common thread through many of the brewery's wilder and barrel aged beer. But, once that's all done, the oak returns and sets up camp, doing its very best impression of a Nice biscuit. As for the Barrel Aged Praline, this spent a mere 12 months in the barrels used previously to age a batch of Imperial Praline; formerly used for cabernet sauvignon, they're now dedicated Praline barrels. The oak adds to the base beer's existing richness, possibly even fattening the body a little, and there's still all that lush chocolate, vanilla and nuttiness. The barrel's main impact, however, has been to add cherry and berry characters as well as a gently souring acidity that helps the beer present as more refreshing than it should.